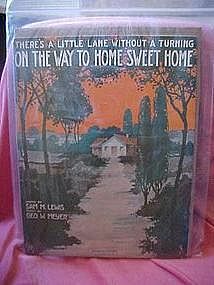 There's a little lane without a turning on the way to..
Old music selection from 1915 titled, There's a little lane without a turning on my way to Home sweet home. Words by Sam M. Lewis and music by Geo. W. Meyer. Nice condition, gently worn, and one tear. Cover artist De Takacs.